The European Medicines Agency (EMA) has approved the first “adjunct” (added to insulin) pill for people with type 1 diabetes in Europe with a body mass index (BMI) over 27. Called Forxiga (Farxiga in the US), the once-daily pill lowers blood glucose, reduces the amount of insulin needed, and has been shown to cause 5-7 lbs of weight loss. Decreased their total daily insulin dose by 9-13%, or about five to eight fewer units. The main safety concern for people with type 1 using SGLT inhibitors is diabetic ketoacidosis (DKA). Over the 52-week study, 4% of participants on Forxiga and 1.1% on placebo experienced DKA. However, for people with a BMI of 27 or more, only 1.7% of the participants on Forxiga and 1.0% of those on placebo experienced DKA. See our infographic on strategies to reduce risk for DKA here – expanded patient education will be very important to reducing DKA rates. We are optimistic that the field can work collaboratively to make sure that healthcare providers and patients are as smart as possible about this safety concern. Notably, this approval follows the recommendation from an EMA committee to approve Forxiga for adults with type 1 diabetes with a BMI of 27 or greater. 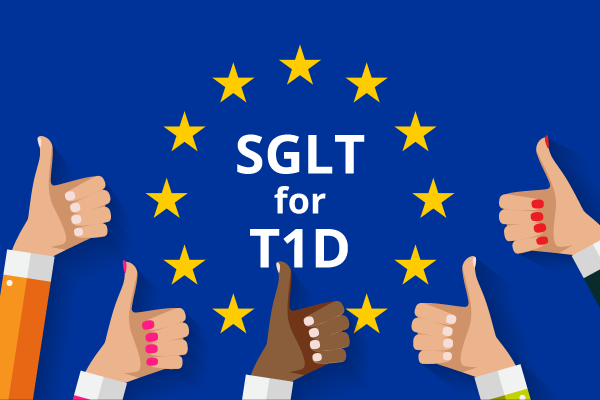 The EMA committee also recommended approval of Zynquista (an SGLT-1/2 dual inhibitor) for the same population of people with type 1. The EMA has not yet made an official decision on Zynquista, though typically it follows the recommendation of the committee.